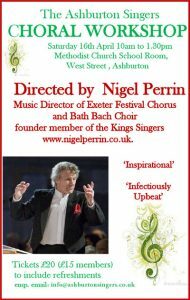 Nigel Perrin was the ex Kings Singer’s high voice and inspirational choral director of, among others, the Exeter Festival Chorus. He will be bringing his own inimitable warm-up and vocal exercises and working on choruses from Purcell’s Fairy Queen, music by Elgar, Holst and Vaughan Williams and two anthems from the Oxford Book of Tudor Anthems. Music will be provided. Booking is essential. Tickets: £20 (£15 members of the Ashburton Singers) to include refreshments. For more information contact Bridget Ansell.